Chocolate on chocolate. Yes, please. I think one of the best things about December is all the cookies. I mean, they’re practically everywhere, and I gotta say, I love it! I mean, who could not? Cookies are the best. I’ve gotten into the habit of sending out a box of cookies to people I work with and close family members the week before Christmas. In prepping for this year’s box, I wanted to have a few new cookie recipes to include, and obviously these Chocolate Espresso Thumbprint Cookies are making the cut. So at the end of each month, I try to sit and jot down some recipe ideas for the upcoming month. Some months I have a ton of ideas and some…not so much. The month of December however is always pages long. Holiday recipes come so easily to me, especially the sweet ones, I just have so much fun with them! And you guys all know that around here, the chocolate just flows, so including some chocolate recipes in the month are a must! Thing is, I only have so many days to post. That makes choosing between them all a major struggle to say the least. Instead of doing the hard work myself, I just sent the list off to my brother and these cookies were at the top of his list. 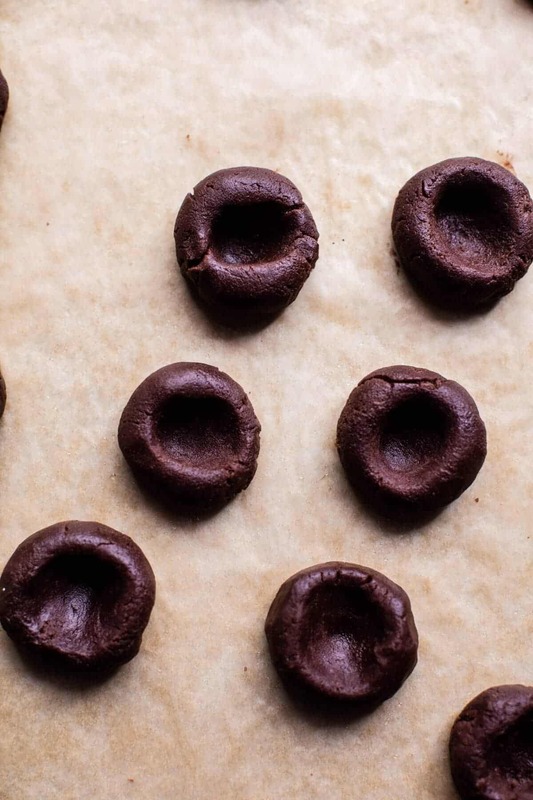 Chocolate Espresso Thumbprint Cookies it is then! Done and DONE. Up until these cookies, I’d never made a thumbprint style cookie. I normally stick to the sugar cookies, butter cookies, or super gooey chocolate cookies. Thumbprints just never really got me excited, but then I wrote down this idea, for an all chocolate coffee infused thumbprint cookie, and I was SOLD. If you ask me, chocolate and coffee has got to be one of the best pairings there is. The coffee compliments the chocolate so well. 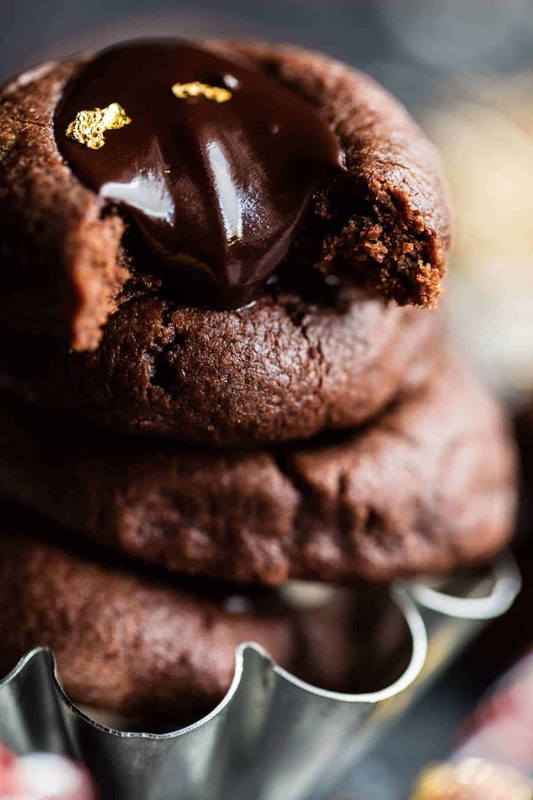 In my cookbook, I have a recipe for lava cakes, I add just a little coffee and I swear it makes all the difference, best lava cakes around <–seriously. So excited about that recipe…can’t wait for you guys to see it, make it, and eat it…coming next fall! Anyway, back to the cookies! With a lot of cookie recipes it seems there’s often the rather annoying step (if you ask me), of chilling the dough. I dunno about you guys, but I can never seem to plan ahead, and when I wanna cookie, I want it fast, not after waiting two hours for the dough to chill, sorry, that’s just not an option. Well, I’m excited to say that this dough needs zero chilling. These cookies are actually pretty fast and easy cookies to make too. Plus you may even have all of the ingredients on hand right now, cause you know I do! Tis the season after all! Plus, Tuesday cookies are the bestest. I mean, right?! These are the perfect cookies to gift, but they’re also great just to bake and enjoy yourself. 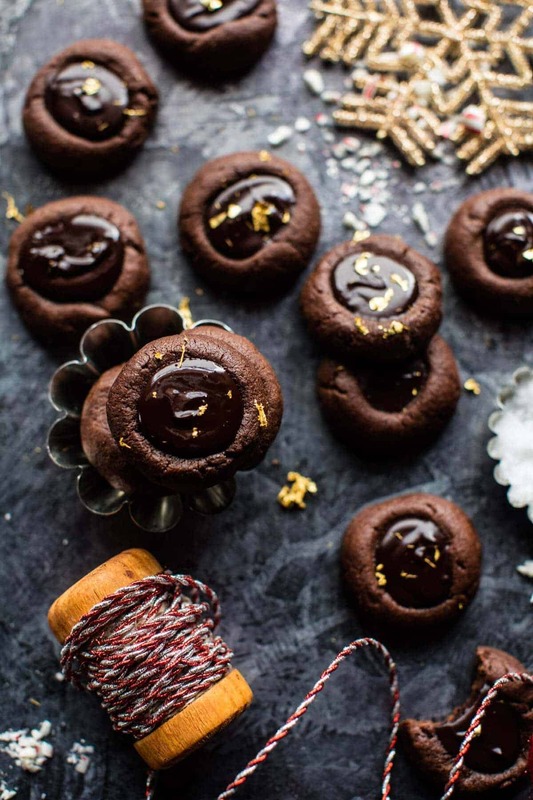 While the cookie is delicious, it’s the ganache that’s key here. Nothing beats biting into that fudgy center, SO GOOD. The cookies are similar to a brownie cookie…moist and super chocolatey…but with a really nice hint of coffee flavor. If you like, you can choose to tone down the coffee flavor by adding less espresso powder, but I prefer to go heavy, the more the better! QUESTION: what are YOUR favorite Christmas cookies? I’m dying to know if some of you are like me and love something a bit more chocolately, or if you’re all about the sugar cookies? Oh and hmm, maybe I should do a round-up of my favorite Christmas desserts sometime before Christmas Eve? Yes? No? Chocolate cookie with chocolate coffee ganache...too good! In a large bowl using an electric mixer, beat together the butter and sugar until light and fluffy. Add the egg, vanilla, and coffee powder and beat until incorporated. Add the flour, cocoa powder, and salt, beating until just combined. If the dough feels dry, add 1 tablespoon heavy cream. Roll the dough into 2 teaspoon size balls and place 1 inch apart on the prepared baking sheet. Using the end of a wooden spoon or your thumb, press gently in the center of each to create an indentation. Transfer to the oven and bake, rotating sheets halfway through, until cookies are just set, about 7-8 minutes. If the indentations lose their definition, gently press the centers in again. Cool slightly on baking sheet and then transfer cookies to wire racks, and let cool completely. Meanwhile, in a microwave safe bowl, combine the chocolate and cream. Microwave on 30 second intervals until melted and smooth. Stir in the vanilla and coffee powder until dissolved. 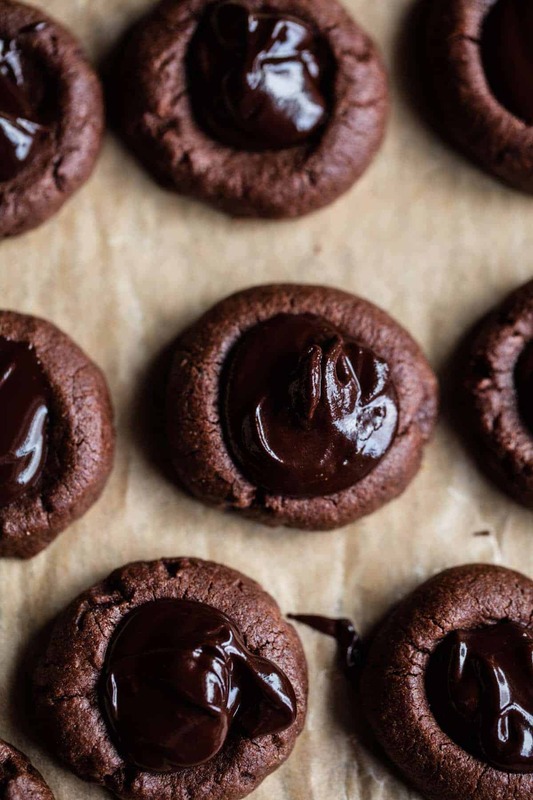 Spoon the ganache into the center of each cookie. 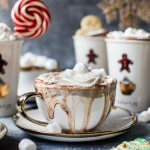 Decorate as desired with sprinkles or edible gold leaf. Keep cookies stored in an airtight container for up to 1 week. Tuesday cookies with a kick…for the win! Oh yum! Love that chocolate ganache in the middle! 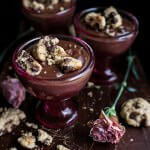 I also put coffee in my choclate desserts I think it intensifies the chocolate flavor. I’m like you, I’m not much on waiting for the dough to be chilled. I want to make the cookies and taste results in no time! lol You really know how to make things so fancy with that gold leaf. 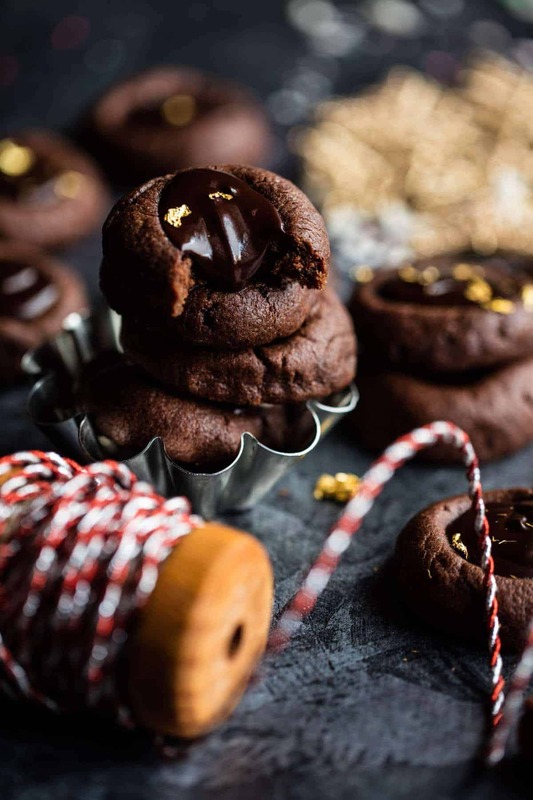 My fave cookie during the holidays is the chocolate crinkles, soft, chewy, sugary, and so chocolatey! And yes to rounding up Christmas desserts! It makes it so delish!! I’m always trying to get the cookies done early haha! AH chocolate crinkles are so so good!! So agree! These cookies sound fabulous! My favorite Christmas cookies are iced gingerbread men. O h my lord, these loooook really delicious!!! I happen to have way to many strange food styling stuff! Lol! Thanks so much!! You can never go wrong with the sugar cookies! OMG.. 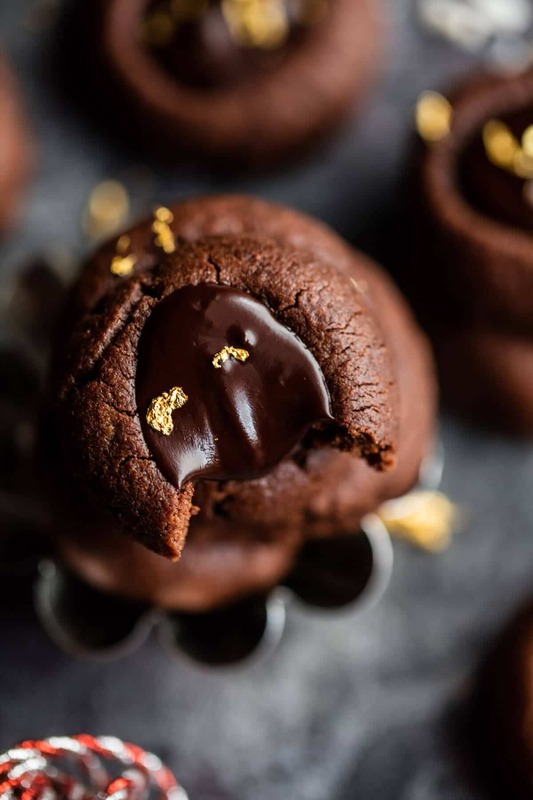 They look so decadent and delicious! My favorites are almond Crescent cookies!!!! Thanks Carlos!! Love crescent cookies!! These look delicious! I’d love to see a list of Christmas desserts! Thank you! These look soooo good! My favorite Holiday cookies are half moon cookies and Russian Tea Cakes. Ah both delicious!! Thanks so much!! YES!!! This is such a great recipe — I can taste it. I have to make them – just for me. YUM! YAY! Hope you love them Marisa!! Thank you so much Kati!! AH! I have that problem too, its when I look at everyone elses blogs! These cookies look absolutely stunning! Anyone who received them would be so lucky! 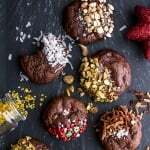 I’m having a cookie exchange soon – these may grace the table! Ah that can be you giving them!! Thank you!! Tieghan, these thumbprint cookies look fab! And that golden touch make them festive! I don’t think I have favorite cookies, but for me it’s a must to bake & ice gingerbread cookies! Thanks Julia!! They are so fun!! My goodness, these look amazing!! Just so inviting! And the gold foil adds a very festive, fancy touch! These delicious and kind of easy to make! I love the flecks of gold and the fact that they are chocolate on chocolate! So happy you like them!! Thanks Rachael! Omg. I love this! 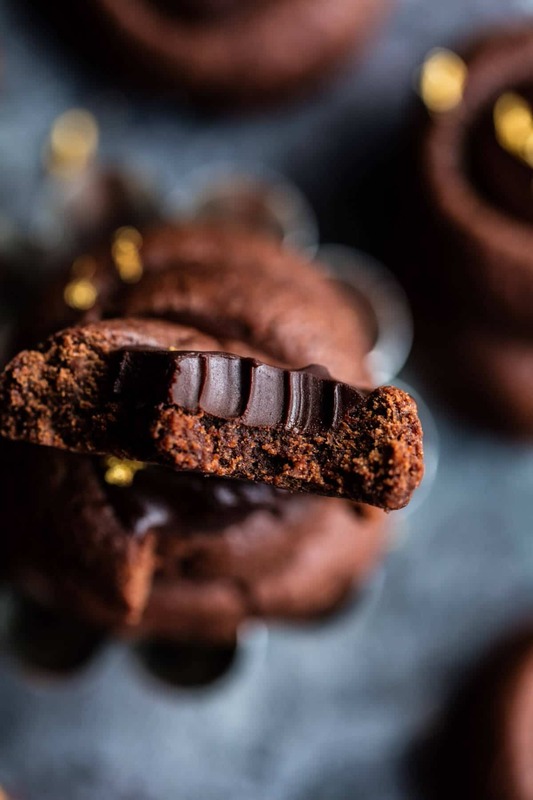 I’m a huge fan of chocolate so this is right up my alley, but I know it’ll be even better with espresso powder! These cookies are so gorgeous and perfect for gift giving. Yes!! The espresso powder is delish!! Thanks Andrea!! Ohmygosh. 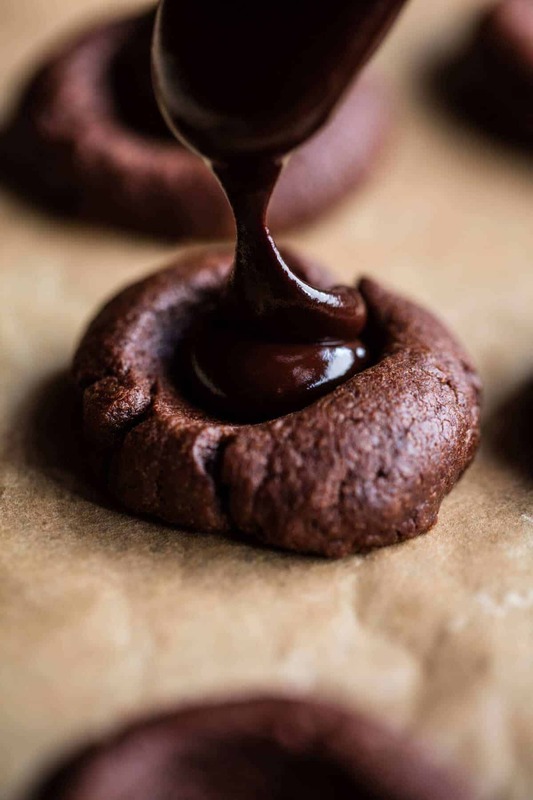 That photo of the cookie with the bite taken out of it… the texture of the chocolate ganache looks HEAVENLY! Ah!! Thank you so much!! I love that photo!! YAY! That sounds super fun!! The cookies round up is amazing!! I love the Linzer cookies!! Cookies are part of my favorite memories of Christmas and these look awesome! Ok so I have EVERYTHING except for the cacao powder and don’t plan to go buy any but still wanna make these, like today !!! What do I do? Omit it simply? Replace it by a a lil more flour? Hey Erika! I am not sure. You could try using an equal amount of flour. That might work. Let me know how it goes. Thanks! (: Glad you noticed! Thanks Jen! My all time favorite cookie AND you made them double chocolate! I’m dead. Wow! These cookies look amazing! I will have to try them this holiday season as they have my two favourite ingredients. Coffee and Chocolate! These sure look great. My husband is a chocoholic. 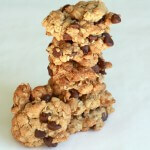 I like it too but my favorite cookies all year long are whole wheat oatmeal with dried fruit and walnuts. Such a healthy but delicious favorite!! 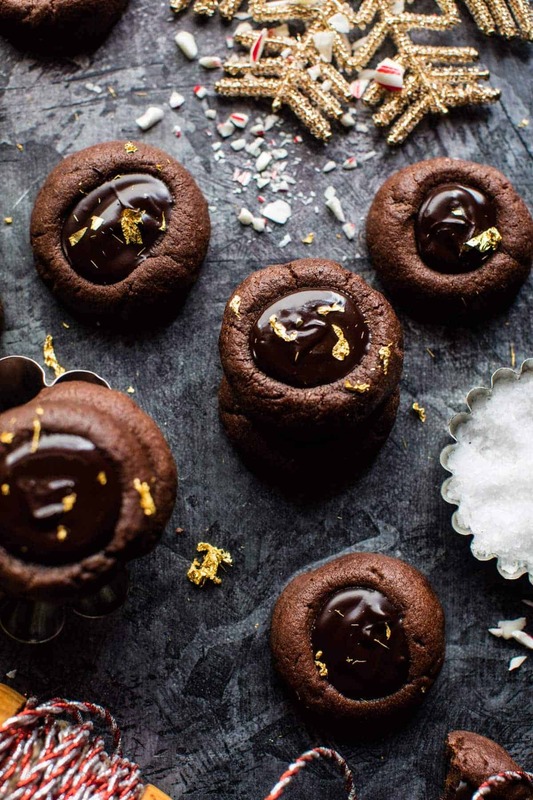 These look absolutely decadent Tieghan! I’m all about these because I’m a HUGE coffee junkie! Way too many cups a day, so add it to a cookie and I’m all in! I say do a round up! Probably some type of shortbread or some anise flavored sugar cookies would be on my favorites list. But now I’ll be adding these! Yes!! So appealing to us coffee lovers!! Ah, anise cookies are amazing! Thanks so much Mary Ann!! Double chocolate is the best!! Thanks Laura!! These look so good! Coffee and chocolate are the best. I have to admit I lean more towards the buttery cookie varieties. Butter cut-out cookies, mini shoo-fly pie tarts, and my favorite- toffee shortbread meltaways! Thanks Mandy! You can’t go wrong with those!! Always delish!! Hi, Tiegh, I just want to ask, if you write 2 sticks (1 cup) of butter, how much is it in grams? In Europe, our classic butter stick means 250 g, but I think the US stick is half the amount –> 1 stick = 125 g. Am I right? Thank you for the reply and have a nice day! HI! It is 226 grams. 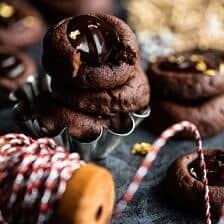 These cookies look absolutely delicious ❤ I also like the fact that they take minimum effort, as I hate complicated procedures 🙂 Am giving these a try, thanks for sharing the recipe! Yay! Hope you love them Kristina!! You combined my two favorite food words (chocolate and espresso) into one cookie!! These look aaah-mazing!!!!! And the orange zest on top is a lovely little festive decor;) How sweet. Ah yay! This cookies is so for you!! Thanks so much! These are such stunning looking cookies!! Is there no leavening agent in these? Hey Katelyn, there is no leaving agents in these. Let me know if you have other questions. Thanks! These look unbelievably good! I have to try making them soon. Hope you love them!! Thank you! Omg. This looks like a little pool of chocolate heaven in a little pillow of chocolate heaven that belongs on my plate right this instant. NEED these in my life! Thanks so much Karly!! I hope you get to make them!! What kind of espresso powder do you use? I have cafe bustelo ar home but it’s not instant! HOpe you love the cookies! YUM just the recipe I was looking for today. Do the cookies come out crunchy or soft? Cant wait to try them! So awesome you converted this! And So happy you are loving these! thank you Eike! Oh no!! Definitely have to be careful how many you eat!! Hey Kate! I am so so happy these were perfect for you and then turned out great!! Thank you so much! I absolutely agree that December calls for cookie baking galore! But then again, you can bake as many cookies as you want year-round IMO! XD I do think that around this time of year, people go CRAZY. These thumbprint cookies look wonderful–I just love the creamy ganache filling inside! Chocolate and coffee taste great together! “2 cup sticks unsalted butter “- is it 2 cups or 2 sticks? Hey Anna, I am so sorry for the confusion. It is 2 sticks butter. Let me know if you have questions. Hope you love these cookies! Thank you Amanda! I am so happy you like these! I don’t think I’ve ever used a recipe for anything that I still remember a year later except for THESE. Seriously the best cookie I’ve had and the only ones I look forward to baking. I’m fixing to bake these for the 3rd time this month for thanksgiving tomorrow! I have a feeling these will be made every year – amazing!! I am so happy you like these! Thank you Liz, I hope your Thanksgiving was amazing! These look awesome and I’m going to be making them for my office potluck.. would i be able to use sugar in the raw as the granulated sugar? Or would you suggest sticking with plain white sugar? Love this recipe idea!! Wondering if you could make the dough and ganache separately and then bake a couple days later? I’m needing to travel but want to make a quick prep cookie once I’ve arrived! Thanks for your help! That is amazing! Thank you Hannah! Any idea if these will survive freezing? Thanks! The smell while mixing and baking is amazing! I made these and my boyfriend and I both took them to work to share with coworkers. One coworker said they were “insane” and another said they were “out of this world.” They were super easy to make and so flavorful and delicious. Highly recommend making them! Wow that is so amazing! I am so glad everyone loved these cookies, Kiko! Thank you!